“The Storm, Frenchman’s Bay, Maine"
John Joseph Enneking received his first art instruction in Cincinnati, OH. He moved in 1865 to Boston, MA, where he received further instruction while earning his livelihood in business. In 1873 he determined to make art his full-time profession and spent the following three years in Europe, studying for nine months in Munich and for two years in Paris with Charles-Francois Daubigny and Leon Bonnat. Settling in Hyde Park, MA, in 1876, he established himself as a landscape painter of picturesque New England scenery and of hazy winter twilight scenes. Enneking had his first major success when a large exhibition of his pictures was held in Boston in 1878. The sale of these paintings launched him as one of the most popular landscape painters in New England. In 1915, a testimonial dinner was held for him at the Copley Plaza in Boston with over one-thousand persons attending. He was crowned by Cyrus Dallin with a laurel wreath, signifying victory and high accomplishment. 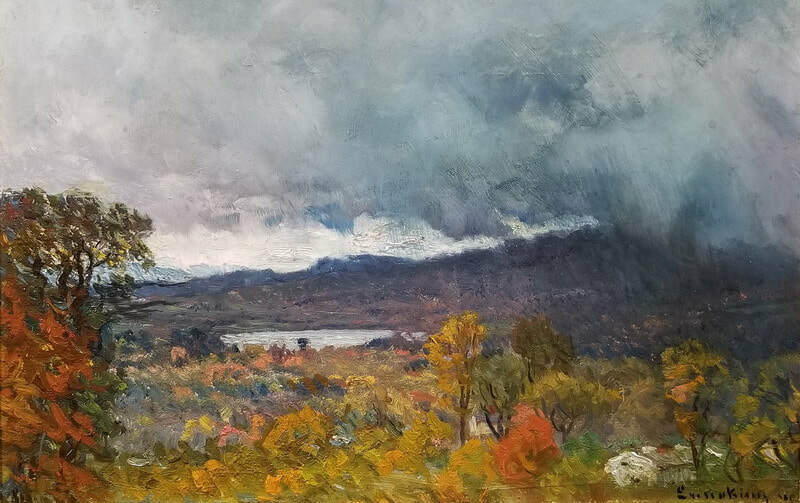 This painting was on exhibit at the annual Poland Spring Preservation Society Exhibition, and was given as a wedding gift to Hilda Mason, a prominent Bostonian, in 1946.